Chef Thomas Schmidt, John Ash and Co.
July 2016 - What to do with all those cucumbers?? 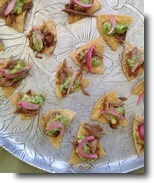 Delicious dish served at the festival--great paired with pinot noir. Tom Schmidt, John Ash & Co.
A richly flavored wild mushroom soup, delicious after a chilly winter's morning foraging for wild mushrooms. A delicious holiday favorite, including a delicious gingerbread recipe. Relish Culinary Adventures was a "Perfect Pairing" with Everett Ridge Winery's Rosé wine. This dish was a featured "perfect pairing" with Michel-Schlumberger Pinot Blanc and Syrah wines. What a beautiful winter day. We lucked out with a one-day break in the rain and cooked up some fabulous ocean-friendly seafood. We had a great event with about 200 people dropping by to see the new facility. We were thrilled that these local chefs and good friends of Relish did demonstrations during the event in addition to Andrea Mugnaini and her staff cooking up gourmet pizzas in our Mugnaini wood fired oven and Larry Frey grilling up his delicious secret-recipe chicken wings. We served a simple appetizer before the farm tour consisting of halved fresh figs topped with Cashel Blue Cheese and a dollop of Balsamic Roasted Onions. We had many requests for the onion recipe that was originally from Chef Britt Galler, so here it is. 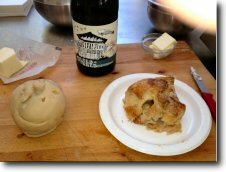 Here are some wonderful recipes using a local specialty--Gravenstein apples. If you can't get Gravs, then Granny Smith or Fuji apples work great. 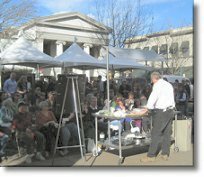 And if you haven't been to the Gravenstein Apple Fair in Sebastopol in August, you need to go! Once again, Chef Kevin McKenzie has put together a winner. This Bruschetta with Heirloom Tomato Jam and Goat Cheese was a big hit at the Windsor Farmers Market where he demo'ed just how easy it is to make. This is a great use for those abundant end-of-summer tomatoes. After paying exorbitant prices at the local store for mediocre mascarpone, Chef Kevin McKenzie did some research and learned that mascarpone is easy to make. This mascarpone costs about one-fifth of the supermarket price and tastes better than most supermarket brands. Relish served these delicious hors d'oeuvres at a festive "after hours" event at the historic Victorian home of Liz and Richard Pembroke of Pembroke Studios. Enjoy! Ralph Tingle, owner and chef at Bistro Ralph in Healdsburg, offset the rich blue cheese souffle main course with this delicious Butternut Squash Soup and a salad of Arugula with Golden Raisins and tangy Balsamic Vinaigrette. Grilled Stone Fruit "en Papillote"
Chef Sandy Poze demonstrated this delicious chilled soup at the Sonoma-Marin Fair in June--it was a very warm evening and the soup was a big hit. He used Unti Vineyards Grenache Rosé wine which has a beautiful salmon color that almost exactly matched the lovely rose color of the soup—and added just the right zing!